About 100 protesters gathered in Westminster earlier to protest against its "demo ban" zone. 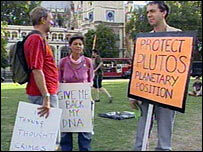 The protest, organised by comedian Mark Thomas, included people demonstrating about everything from war to protecting "Pluto's planetary position". They were in the one kilometre exclusion zone in Westminster, where protests now require police permission. Protesters claim the law is "ridiculous", while the government says it is necessary for security reasons. All those taking part in the mass demonstration on Thursday applied for and received police permission to protest until 1900 BST. They queued up outside Charing Cross police station last week, each individually applying for permission in the hope of creating extra work for the police and to highlight problems with the new law. Among signs at Thursday's mass demonstration was the message: "I'm thinking thought crimes" and calls to nationalise a well-known comedy club. Mark Thomas said: "The point is simply that if one person with a banner can be deemed to be a protester by the police and they need to get a licence six days in advance to enter the designated zone, then we have reached a state of absurdity." Under the Serious Organised Crime and Police Act, all types of demonstration held within one kilometre of Parliament, must first get permission from the police. Several unauthorised protests have been held in defiance of the ban, resulting in fines for several activists. But the protest has had its critics, with Tory London Assembly member Brian Coleman calling them "sad, mad and bad". "Is this really the image we want to give of London - tourists whose income we rely on for the jobs and prosperity of our city?" "It's not a matter of free speech - it's a matter of a proper way of running a world city." The Home Office spokesman said "The exclusion zone, which has the full support of the police, is in place for sensible security reasons. "Applications for protests in the zone are dealt with by the police and considered on a case by case basis."